Lucerne hay is used in all livestock production, but is a particularly valuable resource in the dairy cattle industry. However, the quality of the feed is directly related to nutritional value. For this reason, the National Lucerne Trust’s new lucerne hay quality index (NLQI) has become an indispensable tool for ascertaining the quality of lucerne, according to Walter van Niekerk, an agricultural economist at the University of the Free State. Also known as alfalfa, lucerne (Medicago sativa) is a perennial flowering plant in the pea family Fabaceae. It was one of the earliest crops cultivated specifically for animal feed, and was grown for that purpose by the ancient Greeks and Romans. By the time it was introduced into Germany in the 1500s, hybridisation had already occurred, resulting in, among others, M. falcate, an animal fodder crop tolerant to cold, drought and resistant to disease. More hybrid species followed, including the French or Mediterranean-type, Provence, which is of great importance in South Africa. 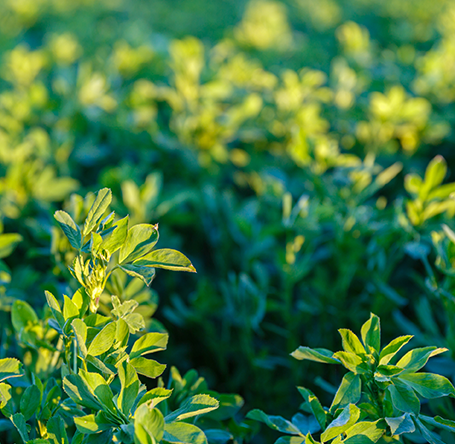 Today, lucerne growers have a wide variety of cultivars to choose from, and base their selection on factors such as dormancy or activity rating, crown height, fit for purpose (hay production or grazing), disease resistance, insect pest Lucerne resistance, and forage yield. Plant breeding efforts use scientific methodology and technology to develop improved varieties. Lucerne hay is commonly included in the diets of lactating dairy cows as it is a rich source of protein and energy. It ferments quickly and has a wide mineral profile while providing the fibre required for rumen health and butterfat synthesis in milk. digestibility of the total diet, resulting in increased dry material intake and subsequent higher milk production,” explains Van Niekerk. How effectively it does this, though, depends on the quality of the hay. Harvesting, climate, soil conditions, cultivar and moisture content during storage all influence this quality. Differences in the quality of lucerne hay can also hamper the accurate formulation of ruminant diets. Although some indicators of hay quality are obvious, such as colour and leaf content, a significant percentage of the nutritional value is not visible to the naked eye. A study conducted by Dr Gerrie Scholtz, a researcher at the National Lucerne Trust of South Africa (NLT), has shown a marked variation in the chemical properties of local lucerne hay. Scholtz compared the chemical properties of different types of hay with milk production and found a clear correlation between acid detergent fibre (ADF), ash and lignin, and milk production. Lignin binds the cells, fibres and vessels that make up wood and the elements of straw. ADF, which includes lignin, cellulose, silica and insoluble forms of nitrogen, is the highly indigestible part of forage. Over the millennia, lucerne has developed into a highly successful cultivated crop. This success is due to the plant’s efficient root system and its symbiosis with the nitrogen-fixing Rhizobium bacteria, which reduces the plant’s dependence on soil nitrogen. The strongly developed taproot enables the plant to access water reserves as deep as 6m, allowing it to survive a long drought. According to Scholtz, the relatively dry and warm conditions, good irrigation water quality and good soils in the Northern Cape are ideal for the production of high-quality lucerne hay. As a result, lucerne is produced on a large scale in Jankempdorp, Hopetown, Jacobsdal, Douglas and elsewhere in the region. Traditionally, the quality of lucerne hay was determined by measuring its protein content, but research has since shown fibre and digestibility to be more important. This has resulted in the development of the world-class NLQI grading system, managed by the NLT. South Africa’s lucerne hay is sought after globally due to its exceptional quality and effective grading. It is exported to the United Arab Emirates, Dubai, Oman and other countries. China, too, recently began importing South African lucerne hay. supply and demand as well as exchange rates. The hay is compressed into high-density bales to save on transport costs. The US is South Africa’s main competitor in the global lucerne market. Lucerne is produced on a large scale in the western parts of the country and China is its closest export market. Local lucerne prices are also determined by supply and demand. At the time of going to print, the price for Grade 1 (NLQI) was hovering around R2 150/t, and the price for prime grade was about R150/t higher. These prices exclude transport costs. The NLT’s new grading system involves analysing lucerne samples using near-infrared spectrophotometry. Once the hay is baled, a representative sample is collected from the bales using a standardised collecting apparatus. The samples are then analysed by a qualified lucerne hay grader to determine the ash, lignin and ADF values. An NLT lucerne hay grading certificate is issued with an index that indicates the grade of the hay as well as the proportion of the various nutritive elements (see table below). Lucerne hay with an NLT quality index of 104 or more is categorised as Prime. The higher the index, the higher the quality of the hay. Lucerne hay with an index value of between 97 and 103 is categorised as Grade 1 hay and is of average nutritive value. Grade 3 lucerne hay has the lowest quality index and could include foreign material such as grasses. Prime grade has low fibre, is highly digestible, and has a high soluble protein content. Grade 1 contains more effective fibre, has an average digestibility and soluble protein content. Grade 2 has more fibre and is less digestible with less protein. Grade 3 has very low protein but a high fibre content. Knowing the quality of lucerne hay will have a marked effect on the income and profitability of a dairy concern, especially when milk prices are low and/or feed prices are high. Top-quality lucerne hay obviously fetches the highest prices. South Africa’s leading grading system makes it possible to determine the production potential of the respective grades. Scholtz’s research has found that the quality of digestible energy and protein could result in a variability of between 35,7ℓ and 48,7ℓ a day in the milk production of Holstein cows. This shows, without a doubt, the effect that variations in lucerne hay quality has on production and profitability.